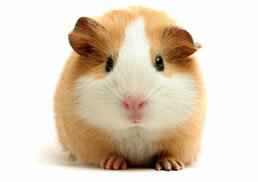 This is a guinea pig. My 282 page grant finally went in Monday – and so now I finally have some spare writing quota to return to the blog! Today’s topic – everything you ever needed to know about clinical trials. The goal is to clear up some misconceptions, and also to help point out the right questions you should be asking about trials as a patient, family member, or provider. In the past, clinical trials for cancer patients were only options when everything else had failed. Participants on clinical trials were desperate, with usually very late stage cancers, and highly resistant disease. Drugs were first tested in humans with little regard for scientific rationale or potential for benefit for patients. Because of this perception, many patients fear enrolling on a clinical trial as they feel like they are guinea pigs in an experiment, or that they are giving up on any hope for a meaningful treatment. Some sobering facts about drug development – the average time for a drug to make it from the laboratory where it is manufactured, to approval by the FDA leading to the ability for doctors to prescribe it for patients with a particular disease, is approximately 10 years. Even scarier, less than 10% of oncology drugs will actually ever reach the final approved state. The cost of the research, development, and testing to bring a drug to the clinic? Over a billion dollars per drug. And we wonder why the pharmaceutical companies try to recoup these losses by jacking up drug prices. And why many doctors don’t have the patience to invest ten years or more of their career on conducting research on a drug that has a 90% chance of being doomed. These statistics are frustrating to everyone – patients waiting for new treatments, doctors trying to conduct research and discover new therapies, and the drug companies. Thus, tremendous efforts are in place to try to shorten the time it takes to bring a new treatment to FDA approval, without jeopardizing quality data regarding the safety and efficacy (whether the drug works or not). How? Understand why the drug works in the lab and mice. If drug A requires abundant protein B to be effective in the tumor of choice, stop and think before designing a clinical trial for all-comers. Sometimes the data is strong enough that you could limit enrollment to patients whose tumors express protein B, increasing the chances of success, and decreasing ineffective treatment and wasted time for patients who are unlikely to benefit. Design SMARTER, more efficient clinical trials. New statistical designs allow determination of benefit with fewer numbers of patients. Fewer patients equals faster time to trial completion which equals less money spent and faster results. Include correlative studies in clinical trials to inform the scientists about why a treatment worked or did not work for patients. Use that information to design the next trial. Learn the maximum amount you can from patients that generously participate in a study! The FDA has increased the use of “accelerated approval,” meaning that trials with extremely promising results gets prioritized in the review process. Additionally, pharmaceutical companies are increasingly making drugs available through “compassionate use” programs, allowing patients likely to benefit from particular drugs to receive them in a controlled fashion prior to the official FDA approval. For patients, the most important thing to know about clinical trials now is that they are not all created equal. It is critical when making a decision about whether or not to participate in a clinical trial that you understand exactly what the particular study is designed to test. The chart below summarizes the major types of clinical trials and includes common questions that are often asked in these studies, and some features about the way they are often run. Phase I · What is the highest dose of treatment that patients can tolerate? · What side effects are associated with treatment? · Is it safe in humans? · How is the drug metabolized (processed) in the human? How long is the drug active and in the system? How often should patients take the drug? · Is the drug metabolism more or less efficient with food? · May include randomization (computer assigns patient to a treatment group). · Now may sometimes be sufficient for FDA approval with compelling results (or larger patient numbers). Phase III · Is the new treatment better than standard treatment? · Take the longest to do since usually looking at overall survival (patients often need to be followed for years) · FDA approvals for tumors with specific genetics instead of specific tumor types? · Approval based on improved quality of life or chance of tumor shrinkage or stability (progression-free survival) instead of overall survival? My major point is that now, even the earliest phase clinical trials may be based on compelling science and evidence of activity in the laboratory. Thus, cancer patients may want to consider participating in clinical trials earlier and earlier in their treatment, if the trials are smart and make sense. For example – in 1998, a Japanese researcher named Dr. Hirota discovered that gastrointestinal stromal tumors (GIST) are driven by a genetic mutation leading to a hyperactive KIT protein. Within two years, Dr. Heinrich from Oregon and Dr. Fletcher from Brigham and Women’s had tested a new drug that could inhibit proteins similar to KIT, which ultimately became known as Gleevec. The first patients treated with Gleevec were guinea pigs for sure – but it was a clinical trial based on profound scientific evidence. A more modern day example came from the discovery that IDH, an enzyme important in glycolysis, was mutated in 70% of chondrosarcomas, cartilage tumors. Since these cancers don’t typically respond to traditional chemotherapy, participating in clinical trials of IDH inhibitors makes very good sense, even if they are early phase clinical studies. Also, the new studies of CSF1R inhibitors for pigmented villonodular synovitis (which is a disease leading to very high levels of CSF1 in the tumors) is logical – and even though they are new, the idea of developing a specific drug for a specific known problem is much more appealing. Additionally, newer types of phase II studies are becoming more appealing. The figure below illustrates an ongoing SMART clinical trial. The backbone of the trial is a known, active chemotherapy regimen of gemcitabine/docetaxel. 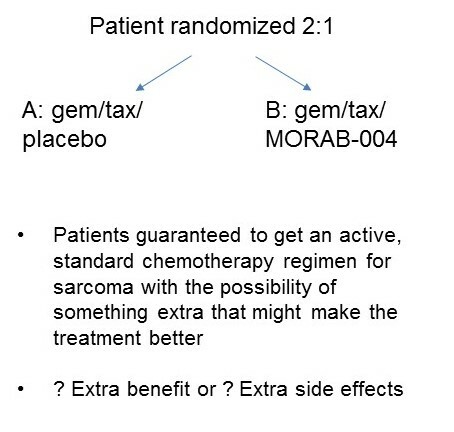 Although there’s a placebo, the way the randomizing is done assures that all patients will be treated with gemcitabine/docetaxel, and might get an extra new drug that might make the treatment more effective, or might just make it more toxic. What is the science behind this study? What are the results in the laboratory and animals? How many humans have been treated with this drug before? What kind of side effects have been reported? What dose level am I going to be treated with? What is the schedule? How many extra labs/studies/visits will I be committing to? Will I know which treatment I am receiving? Is there a placebo? Am I guaranteed active drug at some point along the way? What are the risks of treatment with this study? What are my other treatment options? Are there other clinical trials I should consider? Insist that your oncologist tells you about clinical trials that might be possibilities. The national clinical trials database, http://clinicaltrials.gov can be challenging to navigate, but your oncologist should be able to help you with this. It may be that in the end, the “tried and true” standard treatments are better options which a higher chance of benefit, but in my opinion, knowing the other options out there makes sure you can make an informed choice. Another terrific blog post. For question #7, patients may want to ask their doctors if they know about clinical trials at other institutions that might help them. Too often doctors only mention the clinical trials at their own institution. I wish SARC membership would include a requirement to mention other trials to their patients. Suzie I agree with you! I was talking with a patient’s family recently and was horrified to learn that there are actual consultants out there who will charge patients $2500 up front to search clinicaltrials.gov and find them trials and make a list of places to be evaluated and considered for studies. In my mind this is the responsibility of the patient’s oncologist!